Must-see things and restaurants in Amsterdam? Am taking my mother - and sister-in-law to Amsterdam for only 3 days in mid-November. Budget is not a concern, and we'd like to know what has to be seen, and how best to see it. Am not interested in the Anne Frank house, but good restaurant recommendations will be gratefully received. Thanks! I ate some amazing food in Amsterdam and have some good recos for you! Restaurant Blauw: hands down the best Indonesian food I've ever had - and I've been to Indonesia. You can order a sampler that lets you try all 15-20 dishes. Make reservations! Vers Gesneden Friet for great fries in Jordaan. 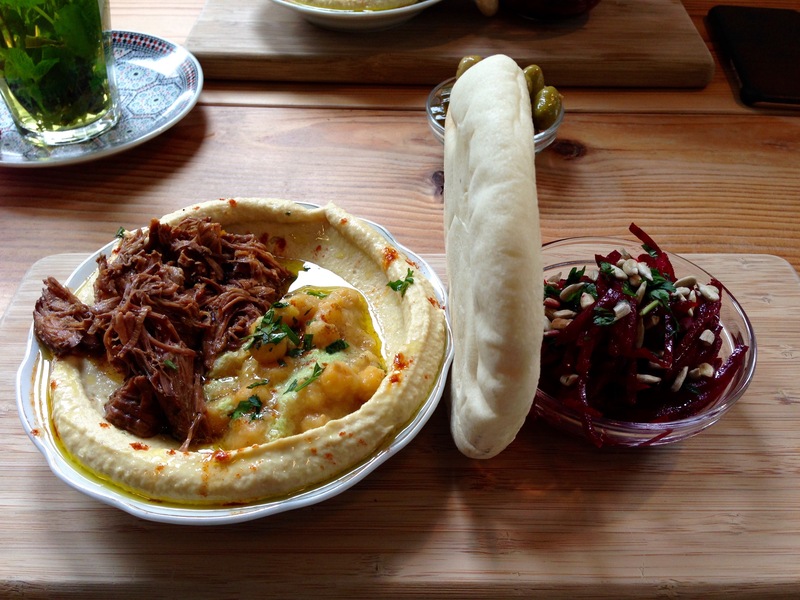 Sir Hummus: Israeli hummus with veggies and pulled beef - really good stuff. fa. pekelhaaring for higher end Italian! In terms of to-do's, I recommend renting a boat on the canal rather than a guided tour. Super fun. Also Vondelpark, the red light district (a bit strange but worth seeing), IAmsterdam Sign, Negen Straatjes, and if you like museums, I've been told Rijksmuseum Amsterdam is the best one in the city. Three days is plenty of time in Amsterdam. You will be able to ride a bike, see the Van Gogh Museum, Anne Frank House and Wynand Fockink or House of Bols, the Cocktail & Genever Experience for the gin experience. You should check out Indonesian Restaurant Puri Mas for some of the best Indonesian food I've ever had (and I've been to Indonesia). Also, when they say hot, they truly mean hot - so opt for the mild if you're not into super spicy food. I would recommend renting a bike to get yourself around. It might seem dangerous as we Dutchies like to go really fast on our bikes, but I am sure you will manage. Don't be afraid to get lost, you always encounter the best places if you don't know where you are or where you re going :-). Just toss your map and cycle around! Amsterdam isn't big, so you could also just walk everywhere. I wouldn't do any hop on hop off tour or anything like that. First go to Haarlemmerstraat with a lot of nice local shops and move along to my favourite canal Brouwersgracht. Continue on to Noordermarkt and the rest of the Jordaan neighborhood. Just zigzag your way through the canals and little streets. There is a coffeebar, cafe or nice lunchroon on every corner. Move on to Negen Straatjes which are the side streets of a part of the canals, full of boutiques, shops and cafes. Also visit neigboorhoud De Pijp. Near Albert Cuypmarkt, Sarphatipark and Gerard Doustraat. This is also a great area. I would recommend going to Utrechtsestraatas well. This is a great street full of restaurants, bars and nice little shops. For museums defitaly go to Rijksmuseum Amsterdam. Here you will find all Dutch art under one beautiful newly renovated roof. Go to the West area of town around De Clercqstraatand Bellamyplein . Here you will find Foodhallen, kind of an indoor foodcourt, but then with nice food, a huge bar and just a general good atmosphere. It is always really busy though! Also nearby is Café Panache which has great food, drinks and atmosphere. No tourists here :-). Don't forget to skip the east part as well! Go to de Biertuin and eat some great chicken and Amsterdam brewed beers on a lovely heated terrace with the locals. After that go for a drink to Henry's Bar or Bar Bukowski. In the 'middle eastern' part of town at around Javastraat you will find more and more nice stores, cafes and restaurants opening. Such as Walter's - The Walter Woodbury Bar and Wilde zwijnen. The one I absolutely love is Rijsel! Basic, pure cuisine, but of really high quality. They are famous for their rotisserie chicken. You so need to reserve around a month in advance though (yes, it is that good :-)). I also really like The Lobby Restaurant & Bar. This centrally located restaurant has a great atmosphere all types of people go here and the food is amazing. Restaurant ANNAis a really good (star quality) restaurant in the middle of the red light district. If you like steak, go to one of the Café Loetje restaurants. There are several in town. They have the best steak ever! Really ever! So tender and the gravy is heavenly. It is always really busy here every day of the week, you can't reserve at most Loetje Restaurants. If you are here on the 15th of November, you are just in time for Sinterklaas! Although he and his helpers (black Pete) might seem weird to you, this is a huge part of our culture. He is kind of like Santaclaus, but then even more important and popular :-). Museum Ons' Lieve Heer op Solder is a hidden church just down from the Oude Kerk Amsterdam in the Red Light District. It takes about an hour to go through, but it's such a special part of Amsterdam. I've been there probably 5 times with various family groups. The Koninklijk Paleis Amsterdam is also more than meets the eye. It takes 1-2 hours to go through, but it was the Amsterdam town hall before it was a palace and the interior is beautiful. The De Slang Snake House is free to see from the outside. There is a lot of street art in the area that is fun to take pictures of. Unfortunately some of the art is being removed, but you might get to see some of it before it's gone. Nearby is the Begijnhof, a quiet courtyard that was once only open to religious ladies. It's also free to see during the day. There is another hidden church here, while the apparent church in the center has a relief of a Pilgrim above it's door. If you have time to leave for a half day, I recommend Zaanse Schans (Marker G), which has a bunch of windmills right next to each other, a clog making shop and a few other typical Dutch things. It's about a 20 minute train ride from Amsterdam Centraal. Just returned from Amsterdam, We were there for 4 days. 1) New King; a Mandarin restaurant with authentic very reasonably priced restaurant in the Centrum and near the Red District. 2) The expensive Japanese restaurant in the lobby of the Hotel Okura Amsterdam. 3) Ciel Bleu Restaurant for drinks and appetizers at the same hotel on the 23rd Fl. with spectacular views of the city. 4) The bar on the 11th fl. of the Double Tree Hilton for drinks and scenery. I definitely recommend the Rijksmuseum Amsterdam to see the best Dutch Masters paintings including numerous Rembrandt and few Vermeer. Also the Van Gogh Museum has the most of his masterpieces in the world. Be careful and watch for the millions bikers who are dangerous and reckless and won't stop for anyone. A boat tour of the canals is a must. Forget the Anne Frank House and the long lines. Dress warm; it was and will be COLDDDDDD!!!!!! You should definitely try the Indonesian food. There are some good Indonesian restaurants in Amsterdam, my favourite is Long Pura. 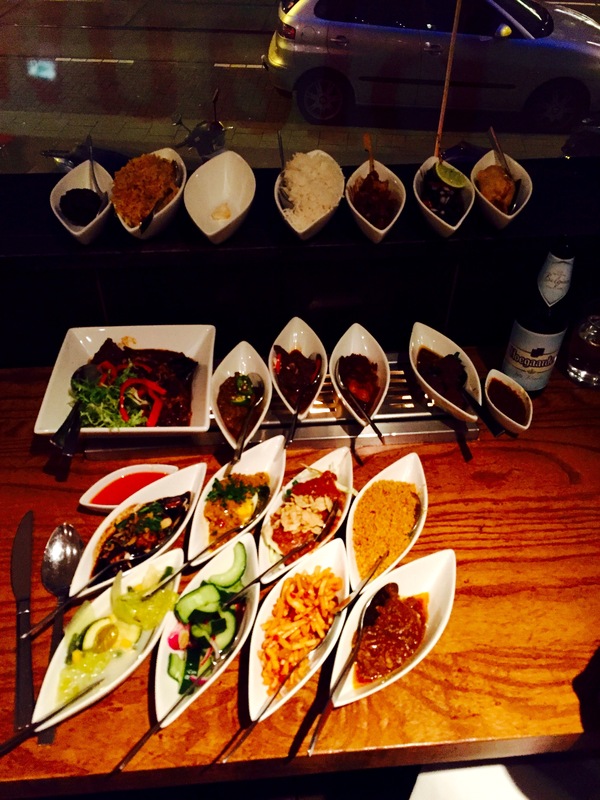 I recommend ordering a rijsttafel, it's the best way to try different dishes ;) Tempo Doeloe or Blauw are also good ones. PS: i am working at tourboks,com so i would be glad to help out further if needed. THE BEST SUNSET IN THE WORLD! There are some very good answers here but I couldn't find anyone recommending EYE - Bar Restaurant for sunset drinks and/or snacks/meal. It is the most beautiful Sunset you will ever see. Amsterdam is below sea level (they are the world's best engineers—especially with building dams and have built a dam in the sea to restrict water from flooding Amsterdam!) and because of this you get a unique perspective when you look at the horizon. This, mixed with the beautiful sky and a lovely, creative set of buildings that they have made on the opposite side (the sun sets behind those short buildings—Amsterdam doesn't have buildings taller than 3-4 floors, typically) makes for the best sunset ever! The EYE is also a Film Institute (Eye Film Institute) and there is often some event happening there. For the Sunset, I would recommend sitting outside. However, the inside feels like you have entered a restaurant in a Big Budget Hollywood Bond Film set. You will have to take a short 2 min boat ride to reach The EYE. The Shell building next to The EYE is also very creative—like most things in Amsterdam. PLEASE DO NOT MISS THE SUNSET HERE! We've been to Amsterdam about five times and stayed in hotels, hostels and a canal boat (through Airbnb). Besides the canal boat, the best accommodation we stayed in was the Stayokay Amsterdam Vondelpark. They are clean, safe, and very reasonably priced. The location is also great - it's a little way from Amsterdam Centraal, but it is right beside Vondelpark and you can get there very easily via the trams or on a bike. They also do bike hire, and have a shed for if you hire your own bike elsewhere. This is a great area for the nightlife of Leidseplein and to get to the Rijksmuseum Amsterdam and Van Gogh Museum early (which you need to do to avoid long lines). Last time I went, we hired a canal boat and drove ourselves around the city on the canals. It was fantastic! We even pulled up to a couple of water-side pubs for a beer. Already a lot of good tips, but I'd like to recommend as well the raw herring sandwich. Really delicious and you can find them all over the place. Before I went to A'dam I wasn't much of an impressionist art lover. Still, figuring it might be a while before I returned I saw as much as I could. That's why I was surprised just how blown away I was by the Van Gogh Museum. I'd never seen his work before (other than photos). Now, I'll never forget it. The Anne Frank House is quite moving, too. However, the line can be long, unless you reserved entry on line. All that being said, the first thing I'll do when I return is take a long, leisurely stroll along the canals. It's peaceful, beautiful, and gives you a real feel for the city. As far as eating is concerned, don't leave without stopping a street-side kiosk for some HERRING. It's the Amsterdam thing to do! If you're texturally sensitive where food is concerned, skip the bun and just eat it with a toothpick. The Museum of the Resistance was wonderful, as well as the Rijksmuseum Amsterdam.